As Huber (2009) states, inquiry-based learning as a higher education didactic method is subject to strong criticism from many quarters. 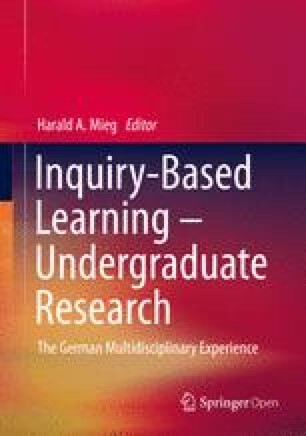 The issue of the unity of research and teaching, which serves as a central pillar for the educational-theoretical justification of inquiry-based learning, is called into question both in principle and pragmatically. This article will present inquiry-based learning in mathematics as an idealized process on the one hand, and in a real implementation on the other. This will be done against the backdrop of cultural-historical activity theory according to Roth and Radford (2011), which more precisely defines the theory for mathematics learning based on Leontiev (1978). Open Access This chapter is licensed under the terms of the Creative Commons Attribution-NonCommercial-NoDerivatives 4.0 International License (http://creativecommons.org/licenses/by-nc-nd/4.0/), which permits any noncommercial use, sharing, distribution and reproduction in any medium or format, as long as you give appropriate credit to the original author(s) and the source, provide a link to the Creative Commons licence and indicate if you modified the licensed material. You do not have permission under this license to share adapted material derived from this chapter or parts of it. The images or other third party material in this chapter are included in the chapter’s Creative Commons licence, unless indicated otherwise in a credit line to the material. If material is not included in the chapter’s Creative Commons licence and your intended use is not permitted by statutory regulation or exceeds the permitted use, you will need to obtain permission directly from the copyright holder.